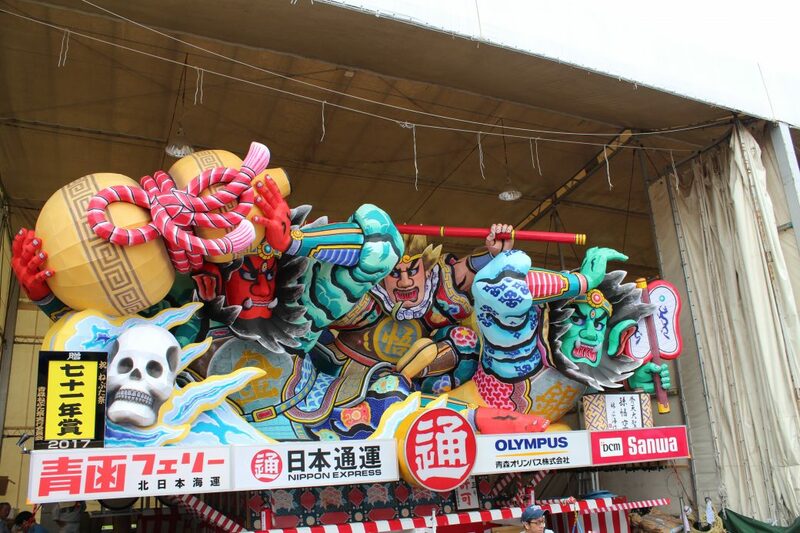 Never having been so far north before, Hannah set out on a road-trip in search of the famed paper-lanterns of Nebuta Matsuri. Vibrant, bustling and impressive, this festival is sure worth a visit! Its origins are unclear, but it is thought to be a cleansing ritual and prayer for good health. Living in Japan, festivals were always one of my favourite things. I love the way that whole communities come together to celebrate their amazing culture. These festivals are always incredibly well-organised! Stepping out of Aomori station there was clear signage directing tourists to the Information Centre which had a good deal of English-language information on the festival. There were also volunteer English-speaking guides willing to give tourists a tour of the floats and explain more about the creative process. I arrived early so that I could spend the day exploring Aomori. For the most part, it’s a sleepy region which attracts little tourist interest. It really comes alive during the festival period! Aomori’s most famous export is apples, and indeed it’s Japan’s best apple-producing prefecture. I took a visit to the A-Factory, a market-style shop selling local produce. From apple tea, to apple bath products, apple-lovers are spoilt for choice here! The A-Factory was also hosting a unique apple-sake-tasting event: for a small fee you could sample 10 different types of apple-flavoured sake and vote for your favourite! After all this sightseeing I was feeling hungry, and so headed to a pop-up food market located near the floats. If you’re under the impression that Japanese food consists solely of fish and rice, then think again! 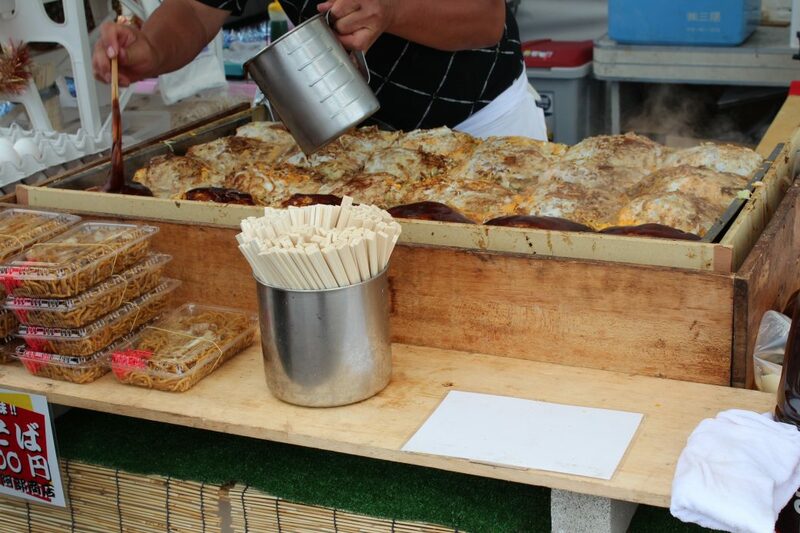 I was delighted to find an okonomiyaki stall, my favourite Japanese food! This savoury Japanese pancake is simply delicious, and it was a treat to watch the gentlemen running the stand cooking a big batch! Well-fed and rested, it was time to check out what else Aomori had to offer. 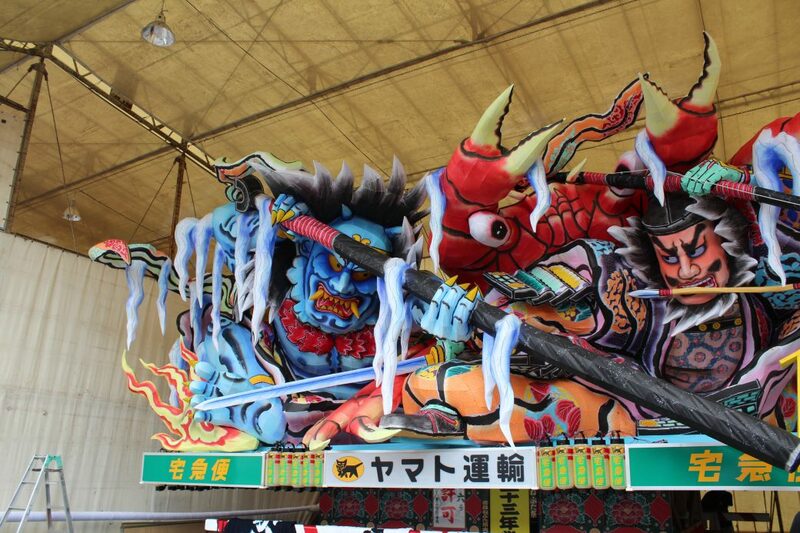 One of the unique things about Nebuta matsuri is that it encourages audience participation! I visited the basement of one of the department store buildings to rent a traditional haneto dancing costume which participants wear as they dance along behind the floats. Being located so far north, the temperature in Aomori was a lot more pleasant than the humidity of Tokyo and Kyoto – it was still very warm to be wearing so many tight layers of costume though! I entered the changing area and was met by two lovely ladies who dressed me in the costume. 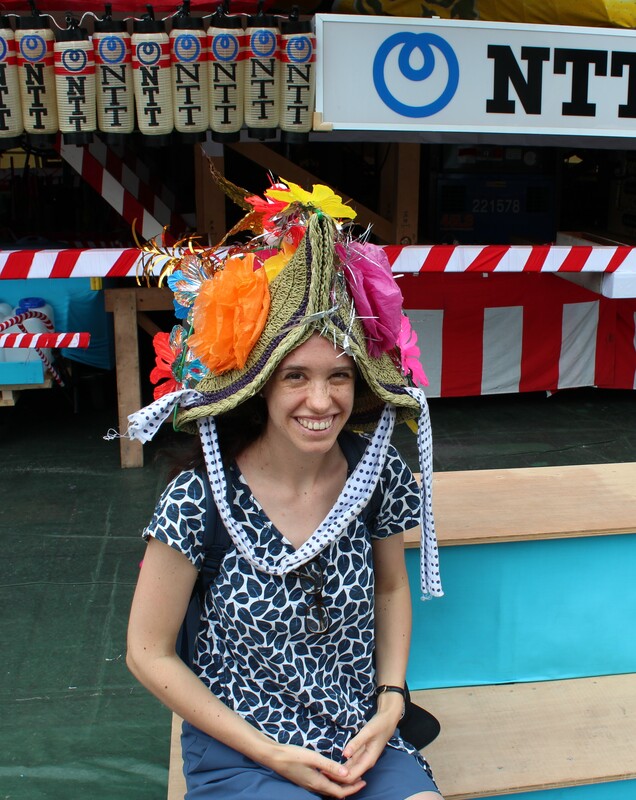 It was 3,5000 JPY to rent the costume for the day, and you are welcome to leave your belongings at a storage point to allow you to dance away to the festival! The costume consisted of four layers of material wrapped tightly around, with some bells attached. I loved wearing it, and the atmosphere was brilliant as everyone walked about Aomori dressed similarly, all excited for the evening’s festivities. When it comes to watching the festival, there is plenty of free seating available on the pavements along the parade route. Tickets are also available for purchase to guarantee a good viewing-spot. It’s customary to bring a bento (Japanese-style lunch box) with you. There are plenty of conbini convenience stores along the route. It’s easy to stock up on some tasty snacks to enjoy whilst you’re watching. As night fell, the parade began. A big band follows each of the floats, as well as a group of dancers chanting “rassera” as they jump, hop and skip along behind! The atmosphere is contagious and it’s difficult to sit still as you watch the floats come by. 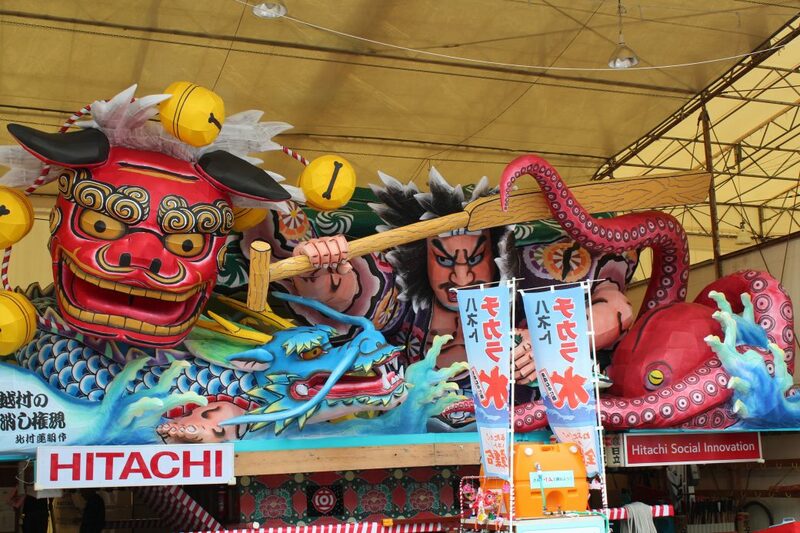 Nebuta matsuri was a magical experience and a true highlight of my summer in Japan. 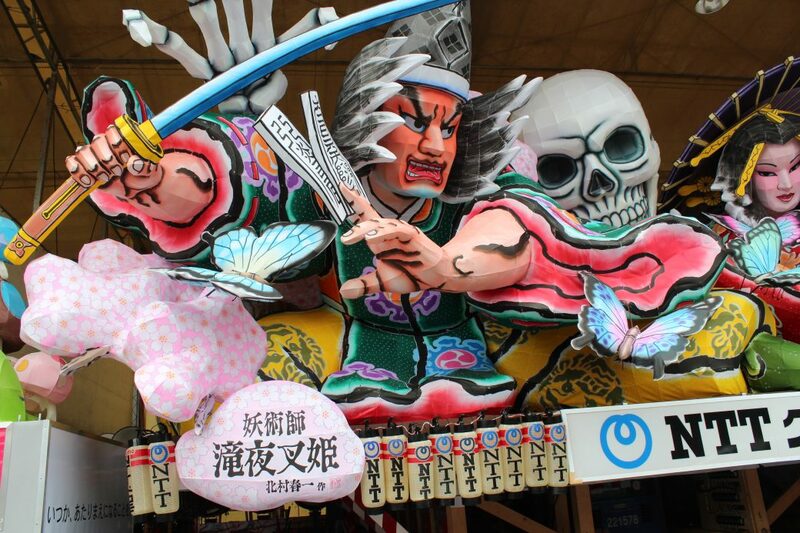 In short: an explosive Japanese festival which encourages audience participation! Recommended for: those looking to immerse themselves in Japanese culture and head off the beaten track whilst in Japan.